Make quinoa, per package instructions (stove top cooking better than in rice cooker). Transfer quinoa to a separate bowl. Cut the onion and pepper into ¼-inch dice. Finely slice the carrot. In a stainless steel pan, sauté onion in olive oil until translucent, then add pepper and carrots for one minute. Add cooked vegetables to the quinoa. Set aside. In the same pan, sauté langoustine in olive oil for 2-3 minutes, adding salt and pepper to taste. Remove to a plate. Deglaze the pan with ¼ cup vermouth. In a small bowl, add the deglazing liquid to the red curry paste, then stir in mayonnaise and siracha. Wash lettuce and spin dry. Slice leaves into ½-inch sections. Add half of curry mixture into langoustines and coat evenly. Add other half into greens and mix well. 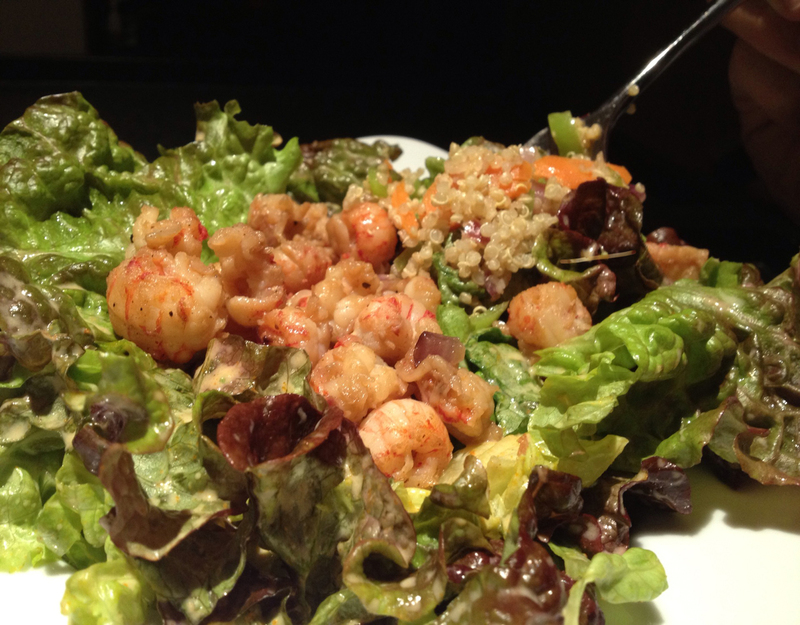 Assemble the salad from bottom up: quinoa, greens, corn, langoustines. This is inspired by a salad at Exki, a Belgian-run healthy prepared food chain. In a one week stay in Brussels this last summer, I had this tasty salad four times.